Star Catcher Classic Slot Review - Casino Answers! Star Catcher is a 3-reel, 3-line classic slot machine developed by Cryptologic, featuring bonus wins. You can play the Star Catcher classic slot machine at [Americans: Unfortunately due to legal restrictions you are unable to play at any of the online casinos this game is at. We recommend you trying playing the unique slots at Win A Day Casino instead.]. Star Catcher is a quarter slot game. Bets on the Star Catcher are $0.25 and $1. 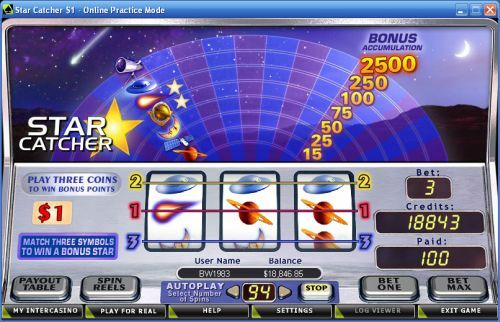 You can select up to 3 paylines per spin on the Star Catcher online slot machine. The maximum total bet on the Star Catcher slot game is $3 per spin. The Star Catcher online slot has a low betting range that is suitable for casual players. To play the Star Catcher classic slot, select your bet with “Bet One” and press the “Spin Reels” button. To play the recommended 3-coin maximum bet, press the “Bet Max” button. The highest paying symbol on the Star Catcher slot machine is the Telescope symbol. If you land 3 Telescope symbols on a payline, you will win the 500 coin top jackpot. You can win this top payout by playing at [Americans: Unfortunately due to legal restrictions you are unable to play at any of the online casinos this game is at. We recommend you trying playing the unique slots at Win A Day Casino instead.]. Whenever you hit a winning combination on the Star Catcher classic slot game, you will add a star to the Bonus Accumulator. By landing a winning combination seven times, you will win the bonus prize associated with that symbol. Once you have won the bonus, that symbol will be reset on the Bonus Accumulator while the remaining symbols will retain their stars. There are 7 bonus payouts on the Star Catcher classic slot machine. The bonus payout schedule is as follows (payouts in parenthesis): Planet (15), Satellite (25), Moon (50), Astrolab (75), Comet (100), Flying Saucer (250) and Telescope (2500). 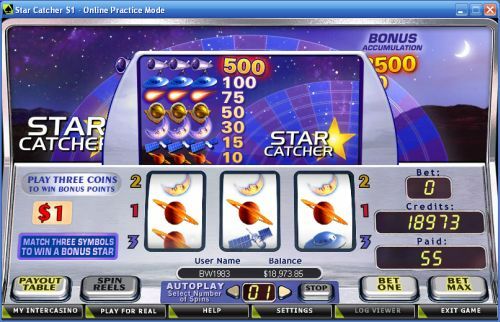 The Star Catcher online slot has a basic autoplay mode. Use the arrows to select from 1 up to 99 autoplay spins. To start the autoplay mode on Star Catcher, press the “Spin Reels” or “Bet Max” buttons. You can stop the Star Catcher autoplay mode at any time by pressing the “Stop” button. While the Bonus Accumulator (under various names) is not an unseen special feature to slot machines, it is by no means a common feature. It gives the Star Catcher classic slot something a little different that rewards the player’s loyalty. It’s always nice to be rewarded, especially when it’s in cash! You can play the Star Catcher slot game when you sign up at [Americans: Unfortunately due to legal restrictions you are unable to play at any of the online casinos this game is at. We recommend you trying playing the unique slots at Win A Day Casino instead.]. How do I win bonus prizes on the Star Catcher slot machine? To win the bonus prizes listed on the Star Catcher slot game, you must hit a winning combination 7 times. Can players from the USA play the Star Catcher online slot game for real money? Players from the United States cannot play Star Catcher Slots for real money at this time. However, you can read our Alien Invasion Classic Slot Review or play it at Bovada. Where can I read more sci-fi slot reviews? If you’re into outer space, astronomy, aliens or the paranormal, you can read more sci-fi slot game reviews by viewing our list of sci-fi slot machines.